Will Leather Goods brings something to Detroit that it needs: Investment. A reason for people, both neighbors and visitors, to come to the city. A destination store. A place to sit a spell, even if you’re not buying something. A beautiful landmark. An experience. Something you won’t find in the suburbs. You get the point. There is the gallery – a large meeting space with a separate entrance onto a parking lot. That means there is room for art, for conversation, for meetings. Detroiters can come in, sit in the well-appointed leather chairs, within the sizable tee-pee in the middle or in the gallery to talk, to collaborate, to discuss next steps. 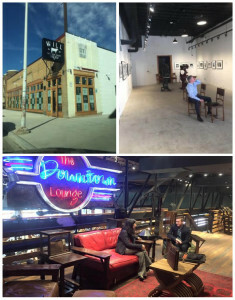 These spaces are open to the public both to enjoy and to use as needed, Adler said, hopeful that his old hometown will not only buy his goods but accept his hospitality.